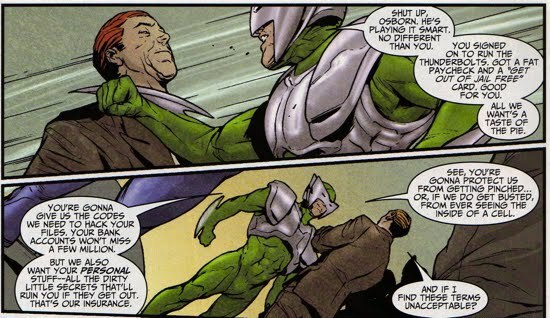 For Norman Osborn and his Thunderbolts team, escaping the legal system proved much simpler than escaping their shady past. And just like the legal system, a villain's past can be exploited. Osborn and Mac Gargan's prior transgressions were brought to focus in the one-shot Thunderbolts: Reason in Madness. After the superhuman Biohazard broke out of containment, the Thunderbolts were called to Topeka, Kansas to bring him back into custody. During the ruckus, Biohazard launched Venom across the city and into a high-rise building. Venom soon found himself in the company of four criminals: Whirlwind, Mr. Hyde, Tiger Shark, and Boomerang. It turns out that these villains intentionally released Biohazard in order to draw out the Thunderbolts so that they could corner Mac Gargan. They gave Gargan a syringe filled with a substance that would temporarily deactivate his nanochain restraint, then instructed him to meet them at a secure location to discuss a proposition. Gargan reluctantly complied. When Gargan met up with the tetrad of villains at their rendezvous point, they claimed to have dirt on him from way back in the day when he was working as a private eye. 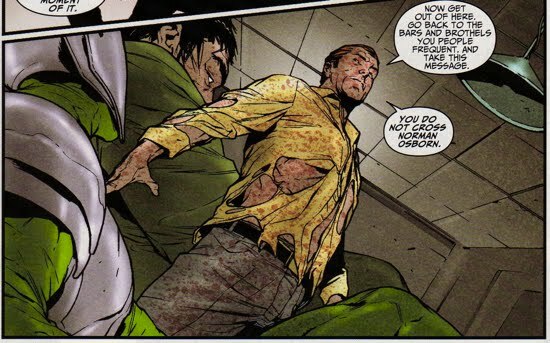 According to Whirlwind, Gargan was hired by Obadiah Stane to steal plans from Norman Osborn involving military robotics. This theft resulted in Norman losing a much coveted government contract. They were clearly trying to blackmail Gargan because they wanted his new boss at their mercy. Whirlwind and the others were convinced Osborn had a myriad of dirt and blackmail-able information on a large number of important, how else could Osborn have risen to such a prominent legal status whilst containing such a horrific past? 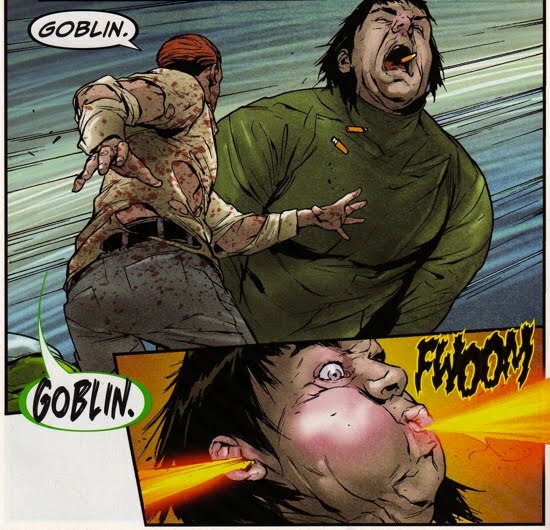 When Gargan returned to Thunderbolts Mountain, he made a deal with Osborn. Claiming he had a contact with dirt on a U.S. Congressman, Gargan convinced Osborn to meet this person in a secure location so that Osborn could add to his massive collection of blackmail-able evidence on important people. Osborn agreed to join Mac, but soon discovered that a trap had been set by Gargan in tandem with the four villains...or so it seemed. Once Whirlwind and the others thought they captured a vulnerable Osborn, they threatened him with brutal force to hand over money, government protection, and his treasure trove of personal secrets that 'would ruin [him] if they got out.' Osborn seemingly caved in and handed them a data stick that contained all they had requested...or so it seemed. Osborn had planted bombs in the disk drives and, alongside Venom, they hand the quartet a serious beat-down. 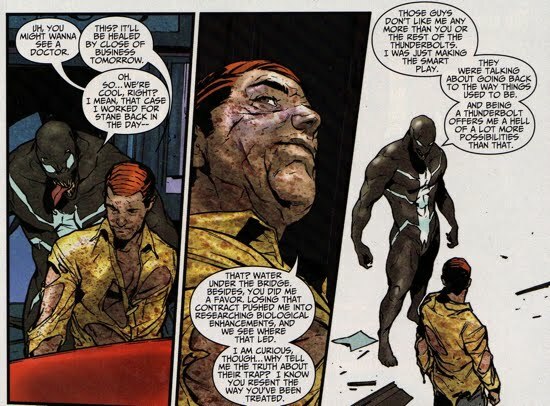 Venom had double-crossed the group and proven his loyalty to Norman. And Osborn did not kill the villains, instead he informed the group that in exchange for sparing their lives they were now under his employ. And if they were ever to interfere with him again, Osborn would kill them and their families and friends as well. Norman and Venom then left beaten villains behind with a newfound trust and respect for each other. 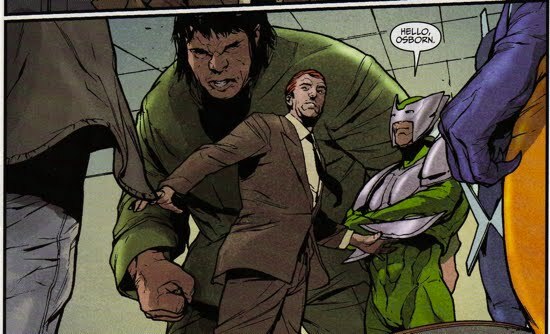 As an interesting side note, Norman made good on his promise to force the villains to work for him because they all (except Boomerang) cropped up again during his Dark Reign. In fact, Norman hired Whirlwind (aka Dave Cannon) as his chauffeur. Of course, it would later turn out that Whirlwind was a mole working for a supervillain named Zodiac. Probably not Norman's best hire. Moreover, Osborn hired Tiger Shark to kill Deadpool after the merc began a campaign to tarnish Osborn's status as the hero of the Skrull Invasion (Deadpool V2 #6-7). Tiger Shark failed in his mission, then tried to blackmail Osborn once the Iron Patriot emerged as the leader of the Avengers. 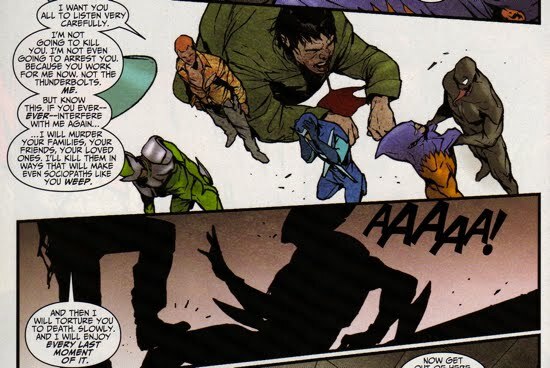 Osborn crushed Tiger Shark's effort and soon landed him and the rest of Lethal Legion behind bars. 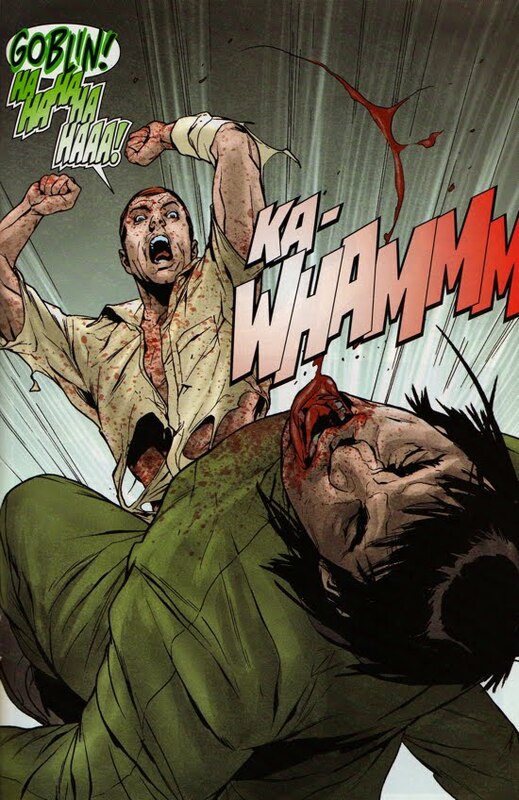 Interestingly, Mr. Hyde was also a member of the Lethal Legion that went after Osborn during his Dark Reign. I wonder if Osborn killed their families and friends they way he had promised them he would?